Recent release “Through the Redwood Hollow” from Page Publishing author Kenna Paige is a tale about Jill and Molly Stewart, cousins of ten and seven years old, who fall through a redwood hollow into Zylandia, a magical land that they must journey through to find their way back home, encountering fairies, gnomes, pixies, countless perils, and an ancient prophesy that foretold of their coming to save the land and the blind pixie queen. Kenna Paige, a nature lover who lives in the Pacific Northwest with her husband and three spoiled cats, has completed her new book “Through the Redwood Hollow”: a riveting fantasy adventure for young readers. Author Paige writes about the impending moment everything will change for the two young girls: “One by one the animal’s noises and movements became part of Mother Earth’s orchestra as they joined in the sunrise symphony. The happy camper closed her smiling eyes and tried to absorb the musical sounds of the forest’s opus as the animals stirred from their nightly slumber. Published by New York City-based Page Publishing, Kenna Paige’s new book is a captivating story for the masses who always felt there was magic in the air and in the unseen. Readers of all ages will root for the young protagonists and fear for their lives in this journey of unexpected chaos. 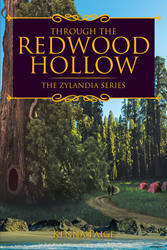 Readers who wish to experience this riveting work can purchase“Through the Redwood Hollow” at bookstores everywhere, or online at the Apple iTunes store, Amazon, Google Play, or Barnes and Noble.